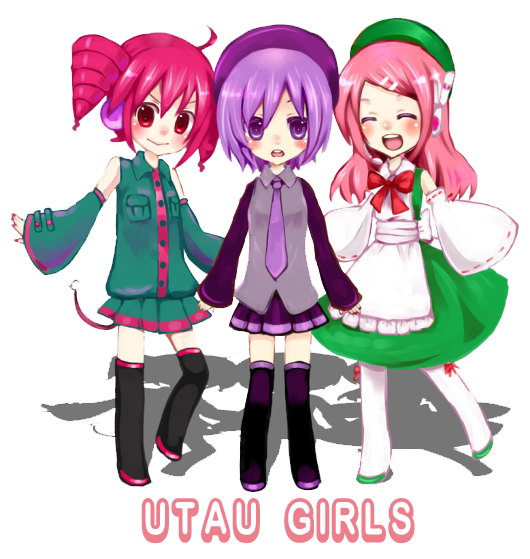 Teto appears in many Vocaloid related music videos (especially in covers), despite the differences between the platforms. Today you can find many original songs for Teto thanks to a certain fan who made it possible. Although most are, due to lack of spread, not well known, some do really excel. Her most famous song, and that undoubtedly has consecrated her is Fukkireta, also called Ochame Kinou or Mischievous Function. This song seems to be a cover of the ending of an anime or TV show. Other well-known songs are Kasane Territory, which tells about her chimera form and Fake Diva, which tells the story of her birth. Currently, Yoshiwara Lament is her most acclaimed original song, far exceeding the old and catchy songs we love! Teto has also made many appearances outside the virtual space. For example, she appears in the Hatsune manga created by KEI, On the label of two sake bottles of Meiko. Her image has also been featured on cars, motorcycles and many other vehicles and items. Today we can find many products with her image and collectible figurines. Currently Teto has been close to becoming a real Vocaloid, as she has made her triumphant appearance in the games or Project Diva 2nd Extend and Project Diva F, being something like a special guest or “honorary Vocaloid”. Moreover, in 2012 she made her debut on stage in the Nico Chou concert, where she sang Ochame Kinou, using the dance choreography of LAT, and the LAT model. In 2013 she appeared in the 2nd Nico Chou, with herbiggest hit Yoshiwara Lament and a TDA model used, with a new dance choreography. UTAU GIRLS (UTAU三人娘): It´s a trio consisting of Kasane Teto (重音テト) with Utane Uta (唄音ウタ, byname Defoko デフォ子) and Momone Momo (桃音モモ). They are also called “The 3 UTAU Daughters or Sisters”. This is due to the fact that they were the 3 firsts Utaloids to be released to public. NEGIDORIRU (ネギドリル): It´s the duo formed by the main characters of the two voice synthesizer platforms: The UTAU Kasane Teto and the VOCALOID Hatsune Miku (初音ミク). 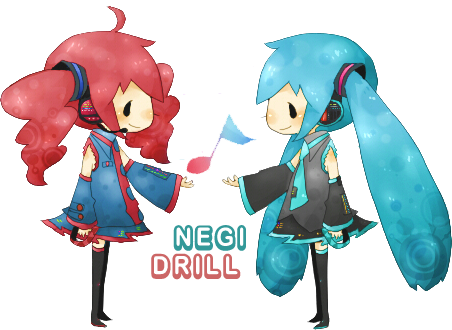 The group name is often translated as NegiDrill or Leek-Drill and was given because of Miku’s item and Teto’s hair. 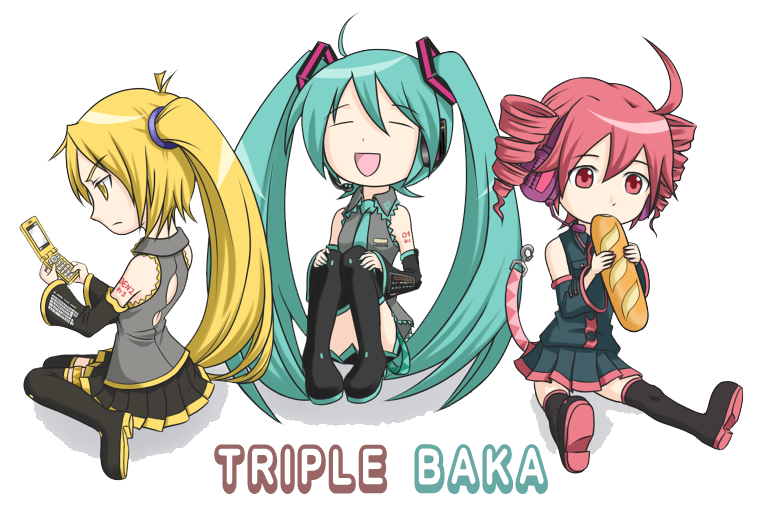 TRIPLE BAKA (とりぷるばか): Another well-known association of Teto are formed with Miku and Akita Neru (亞北ネル), also translated as “Triple Idiot”. It originates from the funny video with the same name, where they appear. MOMODORIRU (桃ドリル): Another less known duo, is the couple of Teto and Momo. English meaning MomoDrill or PeachDrill. First part for Momo (Peach), second for Teto (Drill). TETORITSU (テトリツ): It´s another duo formed how you can imagine by Kasane Teto y Namine Ristu (波音リツ). Are less known than “NegDrill” but bit by bit this couple it´s becoming very popular. Teto and Ritsu fits very well in all songs. They really ignite the flame in our hearts when are together! They complement one to other very well! 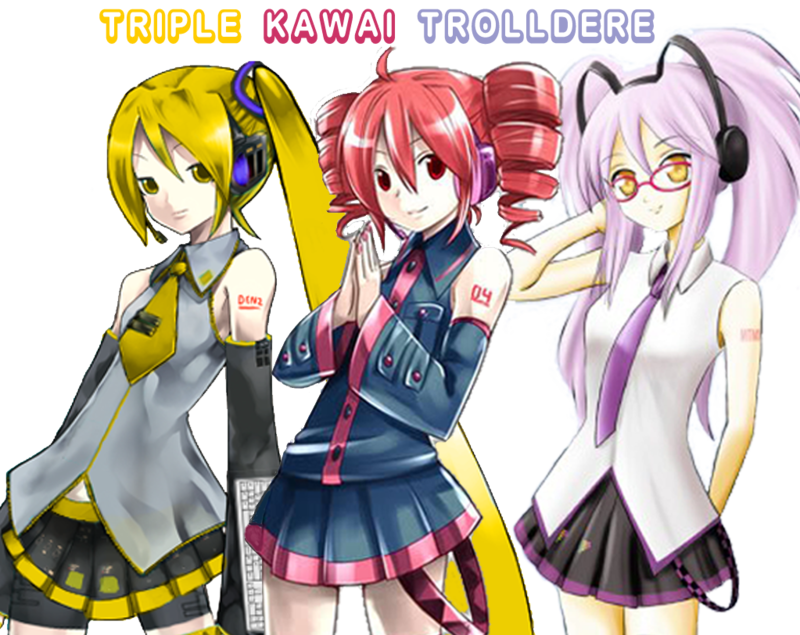 TRIPLE KAWAI TROLLDERE (TKT): Trio almost unknown formed by Teto, Neru and Mitsuko Arisa (愛咲ミツコ); a Mexican UTAU that was released in Mexico at an illegal concert. The name was given by the creators of Arisa and was called so because the three characters began under special circumstances as false Vocaloids. While Teto and Neru were born like a joke, Arisa was born like a misunderstanding that infringed copyrights. 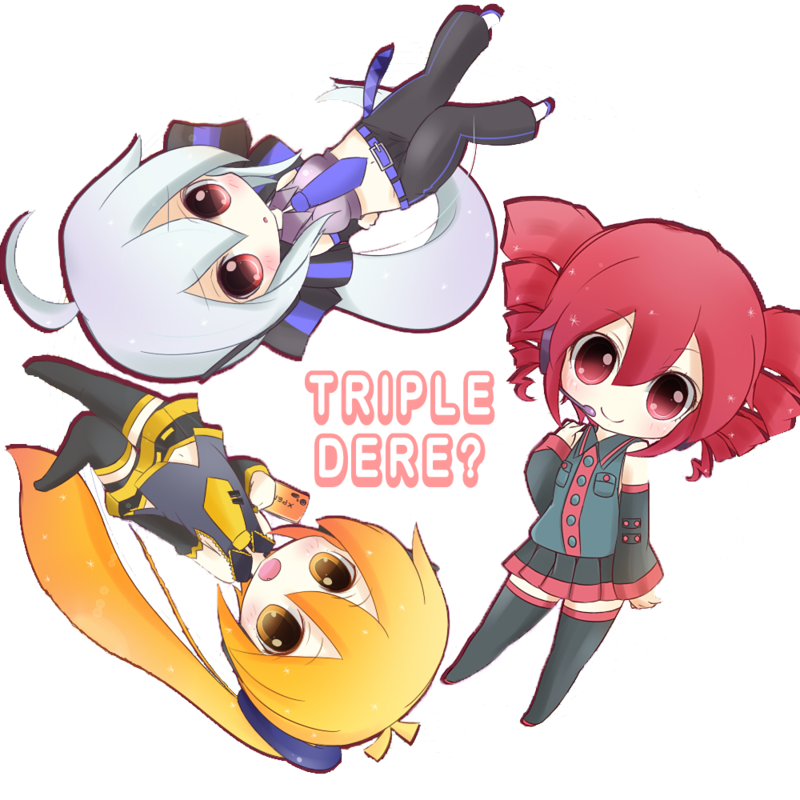 TRIPLE DERE (トリプルデレ): It´s a proposed name to the trio consisting of Kasane Teto, Akita Neru and Yowane Haku (弱音ハク) that currently it has become very popular in the Project Diva F game of PlayStation 3 (PS3). This name is due to the three girl stereotypes of them. They end in the word “Dere” which mean “to become loving or loving”. Thus Teto is “Tsundere” ( ツンデレ), Neru “Yandere” (ヤンデレ) and Haku “Utsudere” (ウツデレ). TRIPLE SUTERE (トリプルステレ): It´s another posible way to name this trio formed by the stereotyped girls. In the term Toripuru Sutereo “Triple Stereo” (トリプルステレオ). Sutereo “Stereo” (ステレオ) comes from the word Sutereotaipu “Stereotype” (ステレオタイプ). The word Sutereo (ステレオ) was changed to Sutere (ステレ) to make reference to the term “dere” of the three stereotypes. Also as a pun, changing the order of words “Stereotriple” looks like “Stereotype”. Teto is very popular at Piapro and much beloved in Niconico. Teto’s popularity is on the rise day by day, to the extent that she can be considered a serious competitor for the number one virtual singer. It’s not just a dream to have concerts devoted exclusively to her and her UTAU companions. She has already appeared in two live concerts, performing two of her best known hits of the past and present. Not only Teto gradually gets more original songs made for her, they are also getting better. Her 3D models appear in many videos and they are among the most cute in MikuMikuDance. Teto has won a lot of fans around the world, and continues to do so. Her cuteness excess, unbridled madness, desire to eat more French bread and the bonus of being a winged chimera with a tail-like chain on her skirt and her drill-shaped pigtails are just a few features that make her compelling, addictive and adorable.